As OECD Secretary-General Angel Gurria presented the OECD Employment Outlook 2018 during a Paris press conference on 4th July, he used big gestures and big words. The fact that the employment rate at the end of 2017 was 61.7 percent among 15 to 74 year olds, and that it was expected to rise to 62.5 percent by the end of 2019, was good news, he underlined. “But it has taken ten years! This shows how big, how deep, how wide and tough the crisis was. Some of the biggest improvements occurred among disadvantaged groups – older workers, mothers with young children, youths and immigrants,” said Angel Gurria. Unemployment within the OECD countries will, according to the organisation, continue to fall to 5.3 percent at the end of 2018 and down to 5.1 percent next year. But far too many jobs are poorly paid or just part-time. OECD has made a comparision of how the real wage growth per hour has evolved during different periods. It is when the blue staple, which represents the seven years before the crisis, is compared with the yellow staple, which is the five years until the end of 2007, that the real wage growth has halved within OECD - even if the unemployment numbers are comparable. Here we focus on how four Nordic countires compared to OECD. 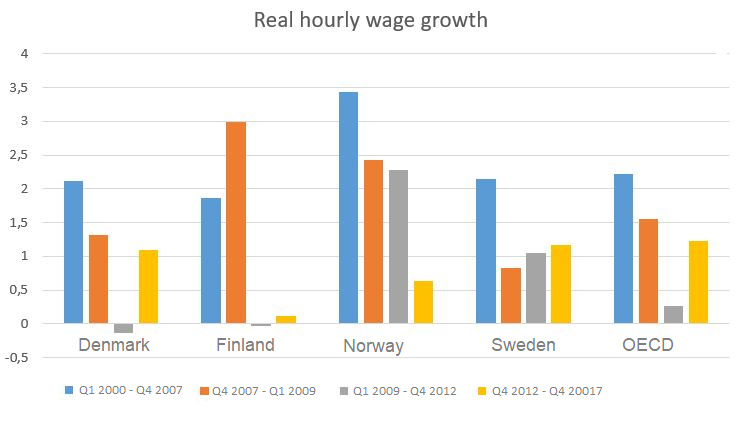 Especially Finland has had almost no real wage growth since 2009. Why is the wage growth so sluggish? What happened to the golden rule that when you have a labour shortage, wages increase? “Take Japan, for example. They now have 1.6 times more jobs available than there are people looking for jobs." 1) Low inflation and low productivity. Inflation decreased from 2.6 percent before the crisis to 0.8 percent in the recent period. Meanwhile, productivity has slowed from 2.3 percent a year to 1.2 percent. But not even the limited productivity gains fully translate into higher average wages. If the development had been the same as during the years 1995 to 2013, real median wages would have been 13 percent higher. Only leading firms, those at the frontier, see wage increases. 2) There has been a change in skills demand. All employers want to hire highly qualified individuals with high-level social intelligence. But almost one in four adults lack even basic information-processing skills. 3) Long-term unemployment may have held down wage growth. Long-term unemployment more than doubled in many OECD countries during the crisis. When you also have a social safety net where only one in three job seekers receive unemployment benefits, the chances of negotiating a wage increase are slim for the job seeker. How to increase wage growth? So what is the OECD’s advice for wage growth? “First, we must build the right skills, to make sure it matches what is needed. But this is where resources are not being spent as they should. Those with the lowest skills only get one third of the further education that those who already have high skills get. The OECD was traditionally an organisation that was criticised for encouraging member countries to carry out labour market reforms with flexibility as a central theme. Now it has become one of the organisations to shout the loudest about improving job quality and wage growth. Only one in three OECD employees have wages which were agreed on through collective bargaining.